Leadership from Luke Air Force Base walk alongside Under Secretary of the Air Force Matthew Donovan as they arrive at the 61st Fighter Squadron June 29, 2018. 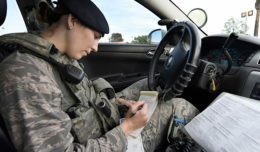 Donovan received the 61st Fighter Squadron mission brief and a squadron tour. 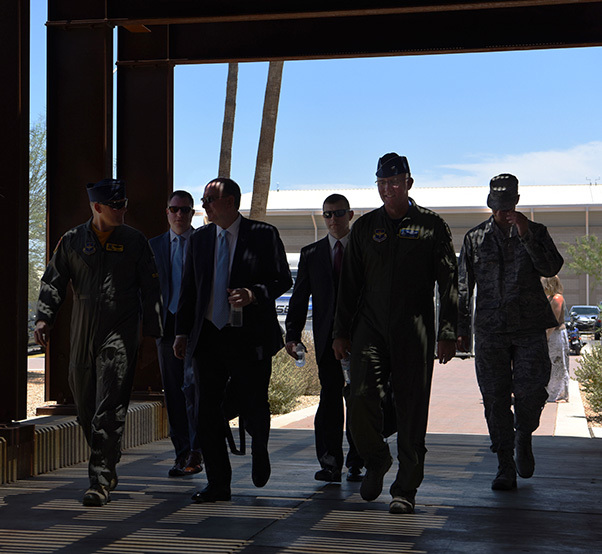 Under Secretary of the Air Force Matthew Donovan visited Luke Air Force Base, Ariz., June 29, 2018, to gain insight into F-35 training operations and serve as the guest speaker for the 61st Fighter Squadron F-35A basic course graduation. Donovan graduated from the 426th Tactical Fighter Training Squadron at Luke in 1983 as an F-15 Eagle pilot. His initial instructor pilot in the F-15 was Flight Lt. Brian Wilson, an exchange officer from the Royal Australian Air Force. While at the 61st Fighter Squadron, Donovan received a mission brief from squadron leadership and took a tour of unit facilities. The 61st FS is one of three squadrons currently responsible for the F-35 training mission at Luke. In addition to training U.S. fighter pilots to operate the F-35, the squadron is integrated with Australia, and Australian instructor pilots train U.S. students and U.S. IPs train Australians. 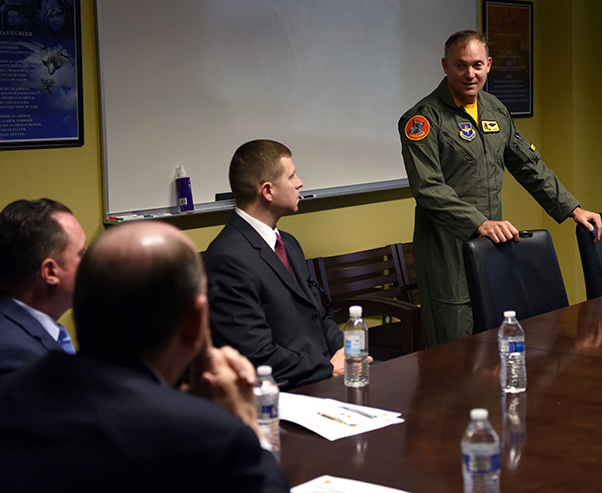 Lt. Col. Rhett Hierlmeier, 61st Fighter Squadron commander, briefs Under Secretary of the Air Force Matthew Donovan on the capabilities of the F-35 Lightning II at Luke Air force Base, Ariz., June 29, 2018. Donovan learned about the aircraft, mission and Airmen at Luke. This year marks 100 years of Mateship, describing the longstanding partnership between the U.S. and Australia militaries. 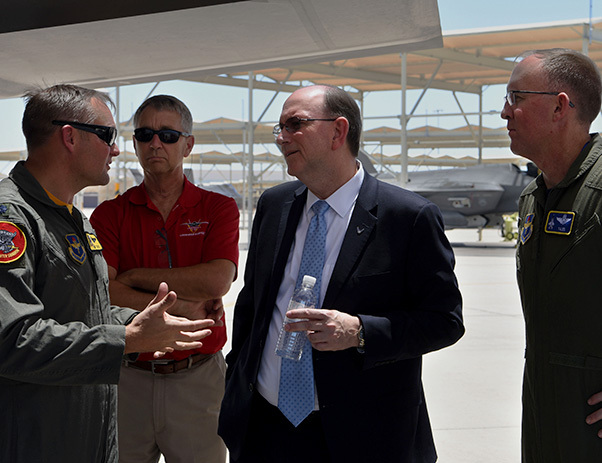 Under Secretary of the Air Force Matthew Donovan receives the 61st Fighter Squadron F-35 mission brief during his visit to Luke Air Force Base, Ariz., June 29, 2018. The F-35 Lightning II is the U.S. Air Force’s latest fifth-generation fighter and will soon replace the aging fleet of F-16 Fighting Falcons at Luke. 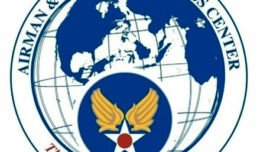 During his remarks, Donovan spoke on how less than one percent of the U.S. population is affiliated with the U.S. military, and of that, only a very small percentage make it through the rigorous training and selection process to become fighter pilots. 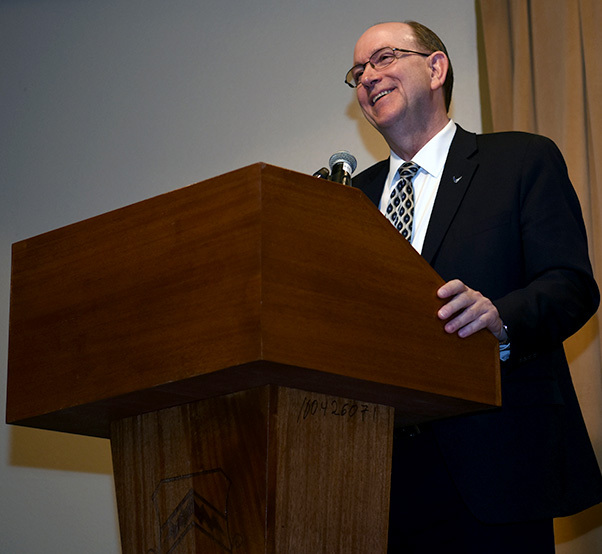 Donovan encouraged the graduating class to take what they’ve learned from their time at the Luke and apply it to their assignments in the operational Air Force. Lt. Col. Rhett Hierlmeier, 61st Fighter Squadron commander, Matthew Donovan, Under Secretary of the Air Force, and Brig. 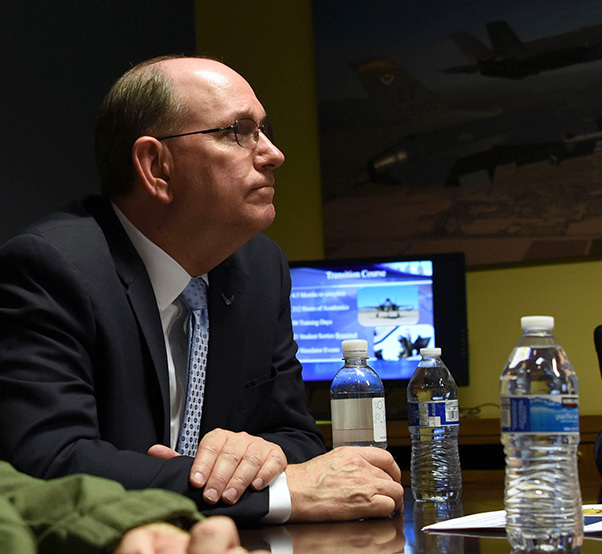 Gen. Todd Canterbury, 56th Fighter Wing commander, discuss features of the wing’s mission at Luke Air Force Base, Ariz., June 29, 2018. Donovan visited Luke to be the guest speaker for the 61st Fighter Squadron graduation ceremony and gained insight into F-35 training operations. Under Secretary of the Air Force Matthew Donovan gives his remarks as the guest speaker for the 61st Fighter Squadron B-course graduation ceremony June 29, 2018 at Luke Air Force Base, Ariz. Donovan graduated from the 61st FS in 1983 as an F-15 Eagle pilot. 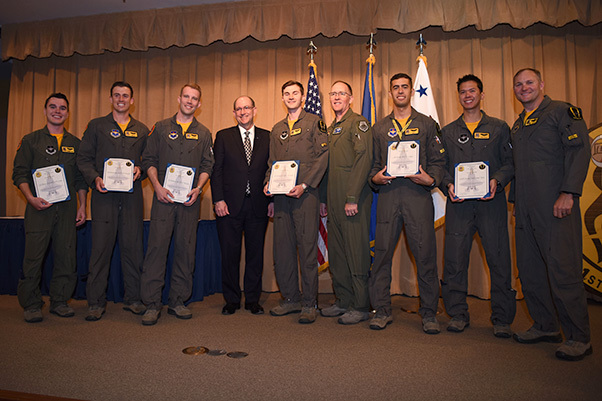 Under Secretary of the Air Force Matthew Donovan stands with the 61st Fighter Squadron B-course graduating class June 29, 2018 at Luke Air Force Base, Ariz. The 61st FS graduated six F-35A Lighting II fighter pilots.